You'll be £14.99 closer to your next £10.00 credit when you purchase Tracing Your Aristocratic Ancestors. What's this? Do you believe you are descended from the aristocracy, or even from royalty? Or do you have a line of descent from a blue-blooded family, but want to know more? How far back do noble and royal lines go? How do coats of arms work, and how can heraldic records tell you more? How can genetics help you find your aristocratic origins? In Tracing Your Aristocratic Ancestors leading British genealogist Anthony Adolph explains how to decode family stories, to find the truth and prove your descent from blue-blooded forebears. His book shows you how to expand your aristocratic pedigree sideways and backwards, incorporating heraldic records and printed pedigrees such as those in Burke's Peerage. In a series of concise, fact-filled chapters he explains how to find out about and prove aristocratic ancestry, defines who is blue-blooded, and describes all the sources that researchers can use to explore this fascinating subject. Under Adolph's guidance, you will travel back into the distant past, using cutting-edge DNA technology and arcane genealogies, back to the evolution of the human race, and the point where real ancestors fade into mythical ones – Adam and Eve, the heroes of old and, ultimately, the very gods themselves. As seen in YOUR FAMILY TREE. A general introduction to genealogy with the added focus that it speaks to our near-universal interest in elites. A useful well written reference guide for anyone with an interest in the aristocracy, especially those wanting to expand aristocratic pedigrees sideways and back in time. In a series of concise, fact-filled chapters he explains how to find out about and prove aristocratic ancestry, define who is blue-blooded, and describes all the sources that researchers can use to explore this fascinating subject. This is an excellent book, liberally illustrated with pictures taken largely of or from the Society’s own collections. The book explores not only how to trace upper class ancestors but the probability of finding such people anyway. Gateways are explored in detail. The approach is always down-to-earth but still enjoyable. This book is highly recommended. Fellow regular Family Tree author Anthony Adolph steps on to the scene now with his new guide to researching and interpreting records relating to aristocratic ancestors. With advice on how to 'decode' family stories of blue roots and prove descent, this entertaining volume will show you how to grow your noble, even royal, lineage back in time. Indeed through the use of DNA technology , he explains how you can trace your roots into the distant past, where flesh and blood ancestors disappear into mythical ones, from Adam and Eve to heroes and Gods! You'll find details of heraldic records and printed genealogies, and more. It is a modern examination of our age-old fascination with the gentry and royalty- could you be in the clan? If you have any British ancestry then it is virtually impossible not to have a small dose of blue blood in your veins and this book will guide you through the processes of proving descent from blue blooded forebears. We've encountered royalty, or at any rate, aristocracy, in our search for our own ancestors at ancestry.co.uk, and until our subscription runs out, we intend to double check everything, just in case it turns out my maternal grandmother (and therefore I) wasn't really descended from Charlemagne! Seriously, this is a valuable insight into what to look out for in going back through the centuries. London: At present there may be up to 200,000 relatives of king Richard III around the world who are unaware they have blue blood in their veins, says a genealogist. After Richard was killed at the battle of Bosworth Field in 1485 the succeeding Tudor dynasty tried to wipe out all traces of his Plantagenet family. His body was only recently found under a car ark in Leicester. Genealogist Anthony Adolph said, however, that the attempt failed and there may be up to 200,000 relatives worldwide who have Plantagenet genes, according to the Daily Express. In his new book Tracing Your Aristocratic Ancestors published by pen and Sword Books, Adolph claimed that noble families multiplied because they were better fed, better defended and cared for each other in times of trouble. Now the links coming to light, thanks to the advances in DNA testing. Adolph cited that Richard’s cousin Sir John Neville is a direct ancestor of first US president George Washington and Second World War general George Patton. Adolph himself is descended from Margaret Plantagenet Pole, Countess of Salisbury, daughter pf the Duke of Clarence, who was murdered by his brother Richard III. KING Richard III has thousands of relations around the world who are unaware they have blue blood in their veins. Two US presidents and a leading Second World War American general are descended from his cousins. After Richard’s death at the battle of Bosworth Field in 1485 the succeeding Tudor dynasty tried to wipe out all traces of his Plantagenet family. His body, thrown in an unmarked grave, was only recently found under a car park in Leicester. Genealogist Anthony Adolph says, however, that the attempt failed and there may now be up to 200,000 relatives worldwide who have Plantagenet genes. His new book Tracing Your Aristocratic Ancestors claims noble families multiplied because they were better fed, better defended and cared for each other in times of trouble. However, descendants of younger members of noble families fell off the genealogical radar and only now, with advances in DNA testing, are the links coming to light. Many younger sons emigrated to the colonies. For instance Richard’s cousin Sir John Neville is a direct ancestor of first US president George Washington and Second World War general George Patton. They can all be traced back to Edward III, who ruled large parts of France as well as England over a century before Richard’s death. Mr Adolph himself is descended from Margaret Plantagenet Pole, Countess of Salisbury, daughter of the Duke of Clarence, who was murdered by his brother Richard III. In his latest book, Adolph goes to some length to warn that vanity, error and downright dishonesty have dogged the truth behind this topic for centuries. This is certainly an interesting book, especially if it is read as a preliminary to research whichever route to the aristocracy you choose. Adolph’s prose glides easily and informatively across the subject and only becomes a little turgid when describing the farther reaches of our ancestry where list genealogists must inevitably replace anecdote and vignette. However, like many research guides, it is getting to the records that really matter and on that count the work definitely serves its purpose, being, as it is, packed with useful sources throughout every chapter. 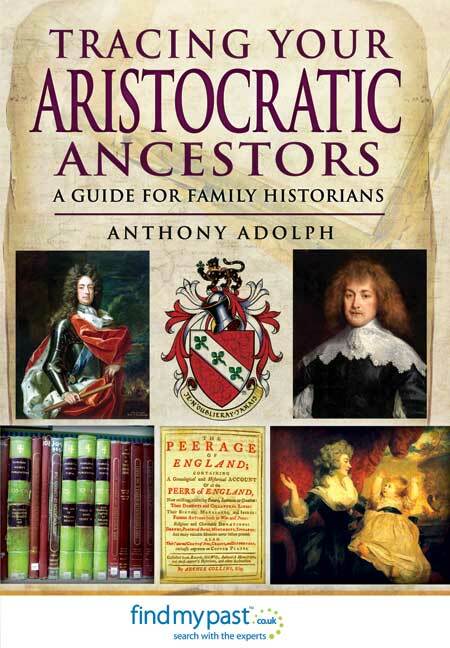 Anthony Adolph (www.anthonyadolph.co.uk) is a well-known genealogist who has made a special study of the history of aristocracy and of all the research resources that can be used to delve into this absorbing field. He is a regular contributor to the major genealogy magazines and websites, he has appeared as resident genealogist and co presenter of television and radio programmes for Channel 4 and Radio 4, and his books include Tracing Your Family History, Tracing Your Scottish Family History, Who Am I? and The King’s Henchman.